Configuration: 16 packs per box. 8 cards per pack. 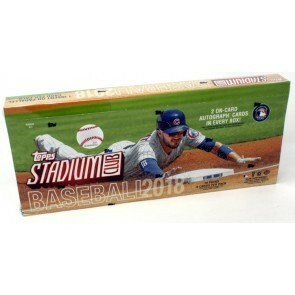 Topps Stadium Club Baseball returns in 2018 showcasing unique and exciting imagery of modern-day stars, rookies, and legends. Returning to the product for the first time in years are iconic ’90s-themed inserts, alongside Chrome base parallels, on-card autographs, and dynamic photography. 300 cards displaying the best of MLB, past, present and future, on full-bleed designs using iconic images.